Wolf’s books and articles consider emotional complexity in ceremonial contexts, the constitutive properties of musical action in rituals, the poetics of verbal and non-verbal activities, the musical qualities of languages and the analytic potentials of particular languages for the study of music. Wolf’s first book, The Black Cow’s Footprint: Time, Space, and Music in the Lives of the Kotas of South India (Permanent Black 2005 and University of Illinois Press 2006), received the Edward Cameron Dimock, Jr. Prize in the Humanities. 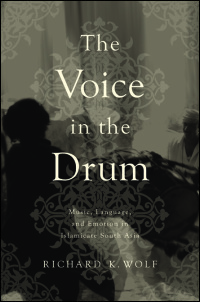 His second single authored book, The Voice in the Drum: Music, Language and Emotion in Islamicate South Asia (University of Illinois Press, Oct 2014), is a hybrid ethnomusicological study written in the form of a novel. As an editor, Wolf is General Editor of Ethnomusicology Translations, an online publication of the Society for Ethnomusicology and has published Theorizing the Local: Music, Practice, and Experience in South Asia and Beyond (Oxford 2009), The Bison and the Horn: Indigeneity, Performance and the State of India (A special issue of Asian Ethnology 2014, coedited with Frank Heidemann), and Thought and Play in Musical Rhythm: Asian, African, and Euro-American Perspectives (Oxford, In Press, coediting with Stephen Blum and Christopher Hasty). Wolf has been the recipient of grants and fellowships from the Radcliffe Institute for Advanced Study, The American Council of Learned Societies, The National Endowment for the Humanities, The Social Science Research Council, and multiple fellowships from The American Institute of Indian Studies, The American Institute of Pakistan Studies, The American Institute of Afghanistan Studies and the Fulbright Scholar Program. He has been a visiting professor at l’École des Hautes Études en Sciences Sociales in Paris and at the Institut für Ethnologie at University of Munich. In 2012, for a lifetime of scholarly achievements, the Alexander von Humboldt Foundation presented him with the Friedrich Wilhelm Bessel Research Award. This has enabled Wolf and the German anthropologist Frank Heidemann to continue their collaborative work “Sight meets sound: Critical media practice and the ethnographic project.” Wolf is also an internationally recognized performer on the vina, a stringed instrument used in South Indian classical music. Wolf, Richard K. The Voice in the Drum: Music, Language and Emotion in Islamicate South Asia. Urbana: University of Illinois Press, 2014. Wolf, Richard K. “The Rhythms of Rāga ālāpana in South Indian Music: A Preliminary Introduction.” In Sanjo and Issues of Improvisation in Musical Traditions of Asia, 121-41. Perspectives on Korean music, vol. 1. Seoul: Ministry of culture, sport and tourism Republic of Korea, 2010. Wolf, Richard K., ed. Theorizing the Local: Music, Practice and Experience in South Asia and Beyond. New York: Oxford University Press, 2009. Wolf, Richard K. The Black Cow’s Footprint: Time, Space and Music in the Lives of the Kotas of South India. Delhi: Permanent Black, 2005.